​The Diocese of Masvingo is the fifth and newest Anglican Diocese in Zimbabwe, established in 2001. It is part of the Anglican Province of the Church of Central Africa and a member of the worldwide Anglican Communion. It is about 8,500 miles from the Diocese of Fond du Lac. The Right Reverend Godfrey Tawonezvi is the first Anglican Bishop of Masvingo. Starting from almost nothing the Diocese has developed during its short life and, despite many challenges, financial, geographical and political, is now in good heart. New churches are being built, congregations are growing, able young clergy are being ordained and the Diocese is also serving the people of Zimbabwe through its education and development work. In the Diocese of Harare I was a Canon, member of Diocesan Standing Committee, member of peace and Justice Committee, chairperson of Diocesan translation committee and acting Principal of Bishop Gaul Seminary in 2001 in addition to my duties as the Dean of Harare. I am married to Albertina and have three children Felistas, Emmanuel and Clare. My other son Matthew tragically passed on, on 23 October 2017 as a result of car accident. I look forward to this companion relationship with the Diocese of Fond du Lac sharing news, experiences and havingexchange visits. ​My name is Ethel Katenjele born in April 1969 at an Evangelical Lutheran Mission Hospital where my father worked as an Administrator and Lay Minister of the Lutheran Church. I did my primary and secondary education at Mnene Mission Schools in Mberengwa, Zimbabwe. I then proceeded to the city of Gweru where I did Bookkeeping & Accounts and Secretarial at a Mission Institution again. I am married to Laurence Katenjele a Lecturer at Masvingo Polytechnic College and got blessed with 3 children; Bernard 27yrs an ITC specialist, Maryline 22yrs an Accounting degree holder and Tinamate 13yrs doing form 1 Secondary education and my lovely daughter-in-law Nomsa who is a Teacher at Learning Ladders Pre-School. I have been blessed with 2 grand children Bradley and Seth, 6 and 2 years respectively. I am a Mothers’Union member: - Diocesan Executive Mothers’ Union Secretary, former Mothers’ Union Enrolling Member and District Chairlady. I am also a deputy church warden at my local church, St. Luke’s church and a District youth advisor. For a living, I do all events decorations, catering, wedding planning, cake making and garment designing. I have notable skills in administration, counselling, singing and above all I love praying. ​I'm Fr. Francis Mudzingwa. 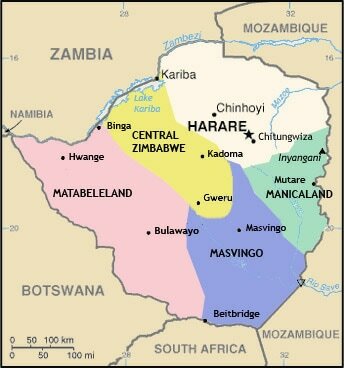 I was born on, 29 September 1970 in Hurungwe District in Mashonaland West Province, Zimbabwe. I grew up in rural areas of Hurungwe under Catholic background. I was ordained a priest in 2003. I served as a Catholic priest for 11 years before joining Anglican Diocese of Masvingo on 1 March 2014. Currently, I'm the Diocesan Education Secretary and serving as the Priest in charge of St. Cyprian Ngundu Church District. I am married to my wife Monica and we have 3 kids namely, Tanaka Paul, Tanatswa Albertina and Tapiwanashe Natasha. We are a happy family. I look forward to learn more about people in the Diocese of Fond du Lac. ​My name is Misheck Mbodza. I was born on 3 March 1980, being the 3rd born in a family of 5, two girls and three boys. I did my Primary education at Warren Park 4 Primary, and my secondary at Kambuzuma 1 High in Harare. I hold a diploma in Theology. I am married to Gaynor Beatrice and we have two daughters Hazel who is 8 years old now in grade 3 and Rachel who is 2 years old. I was made a Deacon in 2006 and then ordained a Priest in 2007. I have served God in different parts of the Diocese, currently am the Priest – in – Charge at St. Apollo’s Parish in Chiredzi. I also serve as the Lay Training officer. I love traveling, watching soccer and reading.